Today’s bike club ride was the old “Glendale Vistas” route. This is a ride that doesn’t go anywhere in particular, but in the process of doing that, it goes up some seriously steep hills. This is the route where I broke my cassette back in 2007. It was pretty chilly today, so we had to wear lots of layers, and even then it was cold. On the way across Glendale, we discovered a new way to cross the freeway on a pedestrian bridge. That was kind of novel, and along with a few other such bridges on other routes, it got us thinking about a possibly theme ride centered around The (Pedestrian) Bridges of Los Angeles County. Hmm. Have to think about that one some more. Adding to the tribulations, when we got to Paradise Bakery, they had no chocolate eclairs. That’s the one thing they make that it truly outstanding, and I’d been looking forward to it. After the snack stop, it warmed up a bit got a little less cold. And then it was time to climb the hills. 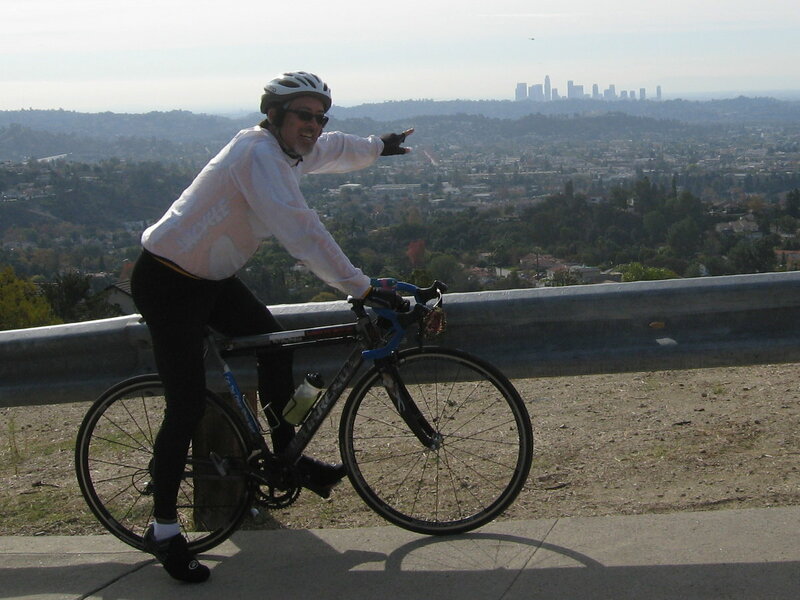 At the highest point of the ride, we get a nice view of downtown Los Angeles in the distance. And I had to stop and once again point out the building that I climbed 101 times this year. On the way home, it started to get colder again. So we cut off a little bit of the route to go home by a more direct way. Still, it wasn’t a bad ride.